I read this article and found it very interesting, thought it might be something for you. The article is called November 2014 – Monthly Income Report and is located at http://www.onehourprofessor.com/november-2014-monthly-income-report/. Hello everyone and welcome to my November monthly income report. I want to take a second to thank all of you who have commented to me on previous income reports about how interesting these reports are and an extra thank you to those who have given me words of encouragement on my journey to creating an online business. This month has been a really interesting one and I can definitely say that I finally experienced a little bit of burnout. Aside from that, I had my best month ever in terms of income, finished up my 90% outsourced niche website experiment, and continued to work on my free internet marketing 101 course which you can get access to here. In previous months, I typically worked around 40 hours on my website and in November there is a substantial drop off where I only worked 16 hours and 45 minutes. Something that you may also notice is that I did a lot less outsourcing this month using Elance. As I mentioned in my intro, I definitely experienced a little bit of burnout this month. Mainly this is because I was offered a contract to develop a course at one of the colleges that I teach at, which is a pretty good paying gig, and there are only so many hours of the day. Because of that contract, I wasn’t able to work on the website is much as I would’ve liked. With that being said, luckily the course is completely developed for the college and now I am able to focus again on my free Internet marketing course. As much as I want to say that the course is completed, I’m just not there yet. I did discover some things while looking at where to host the course and decided that I’m going to host exclusively on Udemy.com. I’m doing this because they have a very nice interface and all I need to do is plug my course materials into it. This whole idea of developing a course through Udemy.com is something that I will definitely blog about in the future because, from what I understand, it’s an easy solution and a great way to make little bit of extra money. My plan is to provide a coupon code for all of those who have created a free account on my website which will allow them to access the course at no charge on Udemy. Aside from that, I’m going to have the course for sale on Udemy for those who haven’t joined my website. My hope is that I’ll be able to get some people straight on the Udemy marketplace to buy the course directly. I haven’t figured out the pricing yet, but I think that I’ll make it affordable considering it’s my first try, maybe somewhere around $30-$50. Aside from working on the course, I spent a significant amount of time on a video quicktip called “What is Social Media?”. I understand that most of you probably look at the title of that video and think, “I know what social media is, I’m not an idiot”. I want to face this head-on and let you know that I understand that, but the video quicktip talks about social media as a whole and why it’s so valuable. I also created a video quicktip about what I think is one of the best-kept secrets in internet marketing which is utilizing Google webmaster tools to increase traffic to your website. This video goes into great detail explaining why this method is such a good idea, how to add Google webmaster tools to your website, how to find the right keywords to focus on within Google webmaster tools, and how to optimize the content you create. Truth be told, I’ve used this tactic many times and when I do it correctly the content that I create gets ranked on the first page of Google within about 48 hours. I know that sounds crazy, and I’m definitely not going to guarantee anything to anyone, but I highly recommend that you watch this video as this strategy has been a real gem for me. This is the third month in a row where I had a loss, but instead of posting a negative meme I’m able to give a little bit of proof about the income that I received this month. I want to mention that the point of this picture isn’t to brag, rather it’s to show that it is possible to make money online and the affiliate that paid me this in November was Hostgator. As you can see in the picture, I did put large red boxes on the check to screen out any account information. Personally I’m a little surprised that I don’t see these checks more often because I have a deal with Hostgator that allows me to provide my website visitors a code (which is “1CENT”) that allows them to try Hostgator hosting for a penny in the first month. 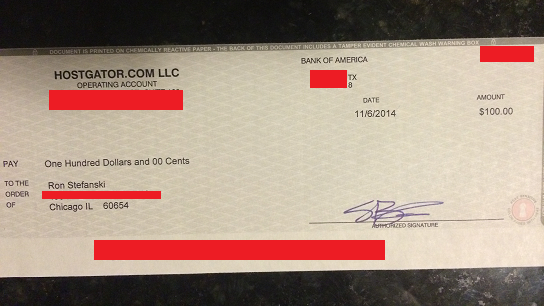 This means that my website visitors will only pay $12.96 if they register a domain and want hosting for a month. Quite honestly, you aren’t going to beat that deal anywhere else and for those that are on the fence about creating a website, it’s undoubtedly the best deal there is. If you have been hesitant about creating your website, the first step is to actually get started. I feel like doing this now would be a great thing to have as a new years resolution. Click here to start on Hostgator today, stop being worried about what you don’t know and take the first step in getting started. Aside from Hostgator being a large revenue generator, I didn’t see a ton of movement on my other affiliates. However, there were some interesting things that are worth mentioning. First, I did see an uptick in my Legalmatch affiliate to 3 conversions which resulted in $7.50 of commissions. Although this isn’t life-changing, it did technically increase by 300% from October, so that was encouraging. Second, I saw some typical numbers with Google AdSense, Indeed, and Aweber affiliate accounts. Nothing to go crazy about here, but the numbers look to be pretty consistent and to me that’s a positive thing. I’m hoping that my Google AdSense account will begin to increase due to the completion of my Niche website. I still have a writer who is consistently putting blog articles up on the site, and we will see if those consistent updates with quality blog posts yields any results over time. Oddly enough, there were absolutely no conversions for my Shutterstock Images affiliate account, but I think this was just a random occurrence. I checked the account multiple times to make sure that it was still getting impressions and clicks. It was but for some reason no one was converting. Hopefully this will correct itself next month. Just like my income this month, expenses were pretty standard as well. All of my fixed costs stayed the same (Hostgator, Aweber, Hootsuite, Long Tail Pro). The only thing that’s really worth mentioning here is my cost for Elance which totaled $146.16. Most of this cost was incurred because I had the freelance writer working on my niche website and she created five articles that I wanted to have up before I did my official launch. As a mentioned in the October income report comments, it was my goal to cut back on my expenditures this month and I was able to do that significantly. Did I Meet my Goals for October? 1) Finish the Internet Marketing 101 course redesign that is only available to those that create an account on my website. I hate to give a sob story, but with everything else going on I just didn’t have time to complete this. HOWEVER, I am very confident I can get all of the content done in December because I have a lot of time off from work and can really focus on it. 2) Finish the structural content of my 90% outsourced website and get at least four blog posts up so that I can officially launch. I was able to get five blog posts up and launch my entire website. The only thing I am having my writer work on is the recommended resources page, but we are golden otherwise. BOOM! 3) Set up a course correctly in Udemy and find a way to give free access to all OHP members while making the general public pay for the course. I was able to set up the course with all modules in Udemy and now I just have to get the rest of the content in there. I’m working on it, but I can get it done by the end of December for sure! 3) Get the course all uploaded into Udemy and share the end result with all of you! I know I am kind of lame because all of my goals are focused on this course, but I need to buckle down and get this thing done! I like you r style.. Keep up the good work !! Hi Ron, Rick here, the guy that emailed you earlier this week about your income report. I admire your honesty and candidness and completely understand your thinking. Press on my friend, stay focused and before you know it, you’ll have quite a following from others that want your advice and direction. Great job, Enjoy your holidays. Thanks, Rick! Your encouraging comments are very appreciated and I sincerely thank you for that email. I hope you enjoy your holidays as well. Good Luck Ron, it takes lot of patience to build great things! I sincerely appreciate the kind words.